In many parts of the world, freedom is something that is taken for granted. The freedom to choose any religion we want or no religion at all, the freedom to be in a relationship with the person we love, the freedom to travel…the list goes on. Unfortunately, there are many, many places in the world where these freedoms are not available to people. If you don’t know what it means to be afraid to voice your opinion, then you can consider yourself very lucky to live in a place where liberty is a priority as well as a basic human right. And like all good things, liberty should be celebrated, and that’s what World Freedom Day is all about. The World Freedom Day is a federal observance commemorating the fall of the Berlin Wall. The day commemorates the end of communism in Eastern and Central Europe and was designated in 2001 by President George W. Bush. It was created to celebrate the reunification of loved ones separated by the Iron Curtain and differing ideologies, and ultimately serves to acknowledge that the resolve of the masses can shift boundaries, break unfavorable resolutions and ultimately determine the type of leadership they desire so as to live is a freer, more fair society. 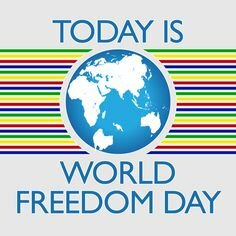 World Freedom Day is celebrated every year on November 9th.